It's been >2 months since I last "penned" a blog entry. I am in complete awe of those who write something every day, year-round. And most of them even have interesting things to report, day in and day out. Me, Heather, and Jen - sweat T-shirt contest winners! I'd had every intention of writing a race report after my Flying Pig Half-Marathon, a month ago. But it was really more of a fun run with friends than a race...which would explain my PW (personal worst) time. The last time I did a race like this (in Vegas) I set an earlier PW. Cincy was the hilliest and warmest and sweatiest HM I've ever run, so that alone eliminated the possibility of a PR (personal record). I also was not trained to go at it competitively. By 10 miles in my calves were talking cramps, even though I was running slower than my typical training pace. In the warmth and humidity I couldn't keep up with hydration, even stopping at each aid station (at each mile marker). By the race finish I felt soaked in about 5#s of my own sweat! Flying Pig was a really good time. I'd love to run that race again, someday. That was my first time in Cincinnati and I really liked the city. I encountered not a single unfriendly person in the entire place. The downtown was easy to navigate from our hotel and there were plenty of places in walking distance to find food and adult beverages. Heather and I road-tripped from MI and had easy driving both ways (aside from my car's A/C crapping out for much of the trip to OH...stupid, quirky Mazda 3). Next year the ladies of RunningAHEAD.com are planning to run the Go! St. Louis marathon/HM in early April. In cycling news: our JDRF training season is well underway. Our team rides have worked up to 40ish mile distance. Yesterday I also gutted-out 70 miles in bare minimum preparation (I am not nearly at the sort of mileage I was at this time a year ago) for the Allegrina 100 charity century in 2 weeks. The "A 100" raises funds for a scholarship benefitting non-traditional students at Grand Valley State University. I am really happy to participate in this event, as I myself was a non-traditional student at GVSU. If my riding mileage is poor, my JDRF fundraising is sort of abysmal. We'll be in Tahoe in 3 months and I've raised <10% of my $4k goal. I am under contract to have raised $750 towards my goal by 90 days out from ride day and could potentially be removed from the program if I don't raise my minimum FAST! Can you help a girl out?! The bulk of my fundraising $s won't be coming in until later in the Summer. I still need to organize my bowling FUNdraiser and I'll be receiving a portion of the proceeds from ODRAM. Speaking of ODRAM, if you'd like to join us in riding across MI in a single day, check out our website, our Facebook page, and our new Facebook group. The group is a really nice way to get to know other riders, find out more about the ride from seasoned riders, and find others to pedal with on ride day or share transportation. 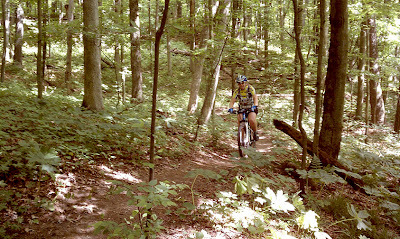 12 miles on curvy single-track...and I didn't even fall once! In addition to road riding I've gotten in some miles on my mountain bike. Not as many as I would like, but I won't ride alone on trails and now that the Boy Scouts are on Summer break the nearby campground land is closed to the general public for riding and hiking. So the nearest good trails are over an hour away. With DS home for the Summer it would also be tricky to get out riding. I'll really be happy when he's a bit older and can join us in the woods. My bike is a hair small, so eventually he will inherit it and I'll likely upgrade to something a size bigger with better specs. Yay! You wrote another post! I don't post very often anymore either. I blame facebook. Love hearing about your races... So DS and I are starting up the C25K again this week. I haven't ran in 2 years, and am kind of terrified. But I can do it, right?!! Hey, you could come run in St. Louis with the RA girls!!! I love that your son is doing C25k with you. I really love that program. I wish I could get my own DS to run with me...he has all the makings of a natural runner (scrawny, long legs, great lungs, boundless energy), but no interest in running. I'm happy that he loves his bike, at least. Jake doesn't have the natural build or stamina for running, but neither do I. It'll be good for us both. He wants to get into shape, and it'll be a good bonding experience for us to go through hell together. Ha, it won't be that bad... I don't know why I'm so apprehensive about it this time - I did great when I did the program 5 or so years ago.